As we age there are many factors that influence our health. Sometimes these issues are serious, sometimes not but it is a fact that we must try and prevent our health deteriorating and protect ourselves from illness in order to live long and fulfilled lives. A healthy heart is vital to achieve this and an awareness of how the heart can be protected from disease is fundamental. What Sorts Of Problems Can Affect The Heart As We Age? There are many things that can affect the heart in the senior years and these include the dangers of heart disease, heart attacks, angina and the effects of diet such as high cholesterol, smoking and stroke.The elderly are more at risk of suffering these problems as the aging process coupled with previous years of neglect or poor lifestyle mean that the heart is less able to function effectively or recover quickly from such problems.By increasing the strength of the heart and indeed oxygen levels in the body illness such as angina can be lessened and heart attack and stroke may be avoided altogether. 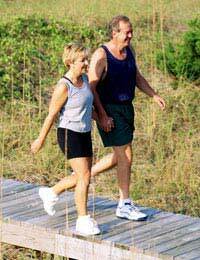 The issue of exercise is something that ideally should be addressed long before a person reaches elder years. The older heart responds less to beginning a healthier lifestyle and it should be protected from damaged by ensuring that exercise is undertaken throughout life beginning in childhood. As the heart is a muscle it needs exercising and exerting in order for it to gain strength and ability. Exercise also encourages a healthy oxygen intake and distribution through the body which is best achieved from participating in regular exercise that causes us to become out of breath at least three times per week.All is not lost however, if you so far have not have regular exercise. Exercise that is beneficial to the older population can still benefit the body and activities such as brisk walking, swimming, gentle aerobics, yoga or even sports such as bowling, table tennis and using equipment in a professional gymnasium are all suitable for this age group. It is never too late to try and lose excess weight that most of us are guilty of suffering from.Those in their senior years however need to be careful that they do not exclude important vitamins and minerals such as dairy produce from their diet, and it is very important to leave these in the diet for the health of both bones and tissues. Initial research carried out has shown that folic acid level increase may be extremely beneficial to the elderly, helping to protect them from many heart problems and maintain the health of the heart. However this research is in its early stages so it is recommended that you see your doctor for further advice and the latest scientific findings regarding this issue. At no time is it going to be beneficial to smoke tobacco but it becomes a very serious issue indeed as we approach senior years.For many smokers the damage may have already been done but it is still usually possible to lessen these effects is smoking is topped. Angina is a very serious and painful condition that warns of damage to the heart and stopping smoking may lessen these episodes and also dramatically cut the risk of stroke occurring.There are many successful stop smoking campaigns going on and your doctor will be able to provide a plethora of information and contact details of support groups or places to go that will be able to help you through this time and help you achieve the status of a non-smoker. The aging process often means that our health worsens or increases the risk of damage to the heart but by taking preventative measures or indeed amending our lifestyles before problems arise should help give us the best opportunities for maintaining health and living longer and happier lives.